A website refresh is well underway. Planet Leicester Bakers, in collaboration with Learning for the Fourth Age, has entered the second half of the Baking a Difference project with even more enthusiasm (if that’s possible!). A brilliant new project coordinator, Anita Barrand, is now on board. We are pushing ahead with building community partnerships to make the care home bread activities a part of elders’ lives into the future. Meanwhile, a new community project partner has successfully secured funding for a completely new and innovative community project. Details will follow. I was delighted to successfully audition for the Women’s Institute speakers’ register last year. Bookings have been coming in for 2019 and 2020. Not only from WIs but from others who have heard about the talk, ‘Good Bread Doing Good’. If you know of any groups or organisations who might be interested in a booking then just drop me a line. Bake Days are scheduled fortnightly. In addition, training and other private services commitments are being booked. Again, just message Planet Leicester Bakers if you are interested in finding out more about anything featured on the website; would like to sign up for the Bake Day e-mails; or if you have ideas you would like to explore. 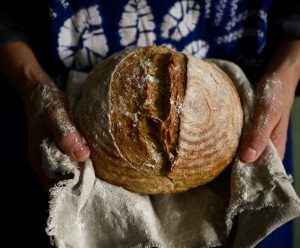 Facebook has predicted bread to be ‘on trend’ in 2019 – as it should always be! Finally, keep an eye out out on social media for the newly refreshed website release – it’s looking pretty snazzy with all the new photos captured since the Joan Ransley food photography day last year.